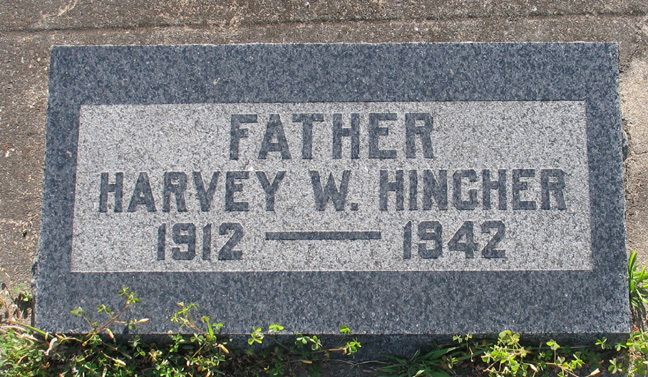 Harvey Wilson Hincher1,3 [Harvey Irvin Hincher4]. Hincher, Harvey, head-of-household, age 27, born in California; completed 8th grade; on Apr 1 1935 was living in Elk, Mendocino County, California; rented home ($9/month rent); occupation: chopper, logging; worked 46 weeks in 1939; $1800 wages in 1939. Hincher, Bernice, wife, age 26, born in California; completed 4 years of high school; on Apr 1 1935 was living in Elk, Mendocino County, California. Hincher, Donald, son, age 3, born in California. Inquest on the death of Harvey Hincher, who 'was killed' in the woods of the Rockport Lumber Company by a "widow maker," was held Tuesday at Rockport. Accidental death was the verdict. Evidence showed that the branch from the redwood traveled a distance of 175 feet before it struck the workman. 1930 census, Alturas, Modoc County, California; roll T626-177, ED 14, page 5A, line #1, dwelling #112, family #123. 1920 census, Ten Mile River Township, Mendocino County, California; roll T625-121, ED 121, page 23A, line #5, dwelling #20, family #20. Ancestry Family Tree data "MOREO FAMILY TREE" posted by "MoreoHannah" (Hannah Moreo ).